Skincare is often the first thing we turn to when it comes to keeping our skin healthy. While skincare products certainly play a role in maintaining clear and supple skin, our diet can actually play a huge role in how our skin looks and feels. Eating lots of fruits and vegetables is important for overall health and wellbeing, and there are a few vitamins and nutrients that are especially helpful for our skin. These include vitamin E, vitamin A, B vitamins and zinc. One of the things that our skin needs to stay healthy and moisturised is water. Drinking plenty of fluids is key to providing our body with enough fluid to replenish and rehydrate skin. Coconut water is especially good for hydration, as it naturally contains electrolytes as well as vitamins that keep skin clear and supple. Healthy fats are also important for healthy skin. Foods like oily fish, avocados, and nuts provide essential fatty acids that protect the skin from dryness and help fight inflammation. 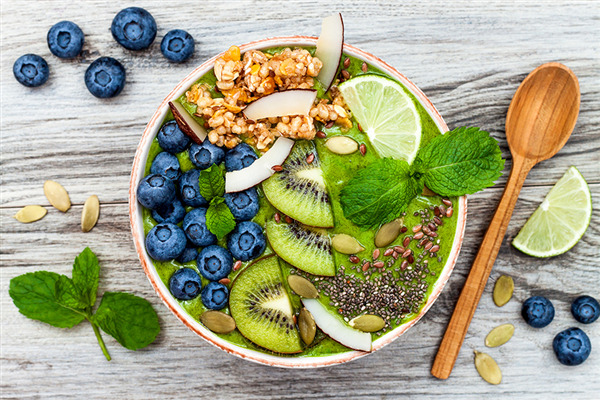 This smoothie bowl recipe contains lots of different wholefood ingredients packed with the vitamins and minerals that will help to keep your skin smooth, clear, and healthy. Add coconut water, frozen banana, baby spinach and avocado to a blender. Add a handful of ice cubes and blend until smooth and creamy. Top with slices of kiwi fruit (rich in vitamin C), walnuts (providing healthy fats and vitamin E) and blueberries (rich in antioxidants). Lastly, drizzle with honey for it’s antioxidant and antibacterial properties, as well as its sweet flavour. Serves one.